Face to Face vs Online Education – How to Approach Them? Face-to-face and online education can both lead to success but each suit different situations and require different approaches. While the latter is steadily growing in popularity, there are important considerations to make before choosing how you complete an education course. Face-to-face learning is generally easier for the student and has a higher success rate. The trade-off is that you have to commit your time to be physically present in a class. When you decide whether online or face-to-face education is for you, consider the following questions. Are Real Life Interactions Essential to Your Learning? You need to determine whether the profession you wish to enter lends itself to online learning. In other words, are real-life interactions with responses, connections and reactions essential to your learning? In some leadership or client-focused roles, this may be the case. Behaviour and body language, including your mannerisms, gestures, tone, language and volume of voice are crucial communication tools. Being deprived of these may affect your ability to develop as a professional communicator. What Learning Style Are You Best Suited to? If you learn best from interacting with others in a social environment, face-to-face training will generally offer more opportunities for discussion and group work. The ability to put your new knowledge into immediate action, ask questions and get immediate answers is a clear advantage. Critics of face-to-face education point out that some problems can arise if students are at different skill levels. Students may need different amounts of time spent on certain topics depending on previous knowledge/experience or their learning abilities in general. You may find it easier to learn your own way rather than in a social, interactive environment. If that’s the case, online education may be the better option. Online classes offer greater flexibility but can be harder in many ways. Rather than having a facilitator who can act as a coach and motivator, you are entirely responsible for your own progress in getting through the learning materials. Follow these five tips to help you succeed. 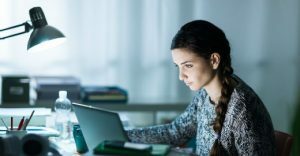 Online classes can be helpful if you have a busy schedule, but you need to make sure you can access the materials. For example, if there are specific programs you need to install onto your computer as part of the course, you need to make sure they will be compatible. You should have a good internet connection, a well-running computer and feel pretty proficient in using technology and troubleshooting computer problems when necessary. One of the biggest mistakes online students make is not contacting their trainers/assessors. They are a great resource and can offer helpful guidance, from understanding concepts to how to approach assignments. Keep in mind that you should also be willing to seek out answers to questions independently when possible. As an online student, you have to accept that while help is available, it won’t be there at the snap of a finger. Most online courses are structured to be easy to navigate and have clear expectations. Instructors will sometimes offer guidance on how much time you should spend on different aspects of the course. Once you understand these, create a schedule to ensure you consistently complete tasks and study when necessary. Make sure you have a place you can study or complete assignments, whether it’s a coffee shop, the local library or at home. Try to make it a consistent location free of outside interferences. You don’t want to find yourself sitting next to a crying 2-year-old while trying to complete a test. Students in face-to-face classes have a consistent schedule they can easily follow, guided by regular physical classes where they receive instructions and complete activities. Online students need to take it upon themselves to ensure they stay organised. Use a calendar, keep coursework materials neat, and set aside time to work on the course. If you’re looking to study or upskill with a course in property, finance, business, or leadership and management, consider the Australian College of Professionals. We offer a variety of courses in the above industries with both face-to-face and online options available. We can help you develop your career with a course that suits your learning style. If you’d like more information, contact us today on 1300 88 48 10 or get in touch online.